Ike: Should I expect flooding? We're up on a hill, but the bayou makes me nervous. I haven't live in the East End long enough to know how it handles water. You are A-OK! Don't give flood/surge damage a second thought. But you and your neighbors do need to clean up the nasty construction site that Waterhill abandoned. And if you're next to one of those partially-completed rotting hulks of timber, you might want to say on the opposite side of your home from it. To their credit (and this is a first), Waterhill sent out a crew yesterday with bulldozers and dumpsters to pick up wood scraps, lumber, and all that other crap around the property. Thankfully, I'm not next to one of the "skeletons," as we have come to call them. Thanks for the flood reassurance, Niche. Good luck to everyone. They probably realized that if they don't make at least a good faith effort to prepare, they won't be able to collect an insurance claim. That, and they would be looking at a lawsuit if some of their debris went flying throught he air at 100mph into UHCoog's house. Does anyone know how the bayous behaved? Did any go way out of their boundaries? I believe the wind did the most damage. I didn't see as much rainfall with this storm as with the others. Probably due to the fact it was moving through soooo fast. Was very similar to Alicia for me. White Oak bayou flooded some, my wife took some awesome pictures of it from the car. Same for Buffalo bayou. I don't think buffalo bayou got higher than for Allison, but I bet it got just as high. But 1 day after the rain stopped, it was back down. So the bayous worked like they were supposed to in my opinion. Brays flooded the lower parts of Idylwood (this is between Lawndale and the Gulf Freeway). All that work they have been doing on Brays and it flooded some homes along MacGregor Way just like any other big storm. Awww man, that's disappointing...I would love to own a house in that neighborhood. Flooding must have been at the low spot around the curve, or where that gully runs back behind that one house, by the park, where that pipe is exposed, where the land is so sloped. I wouldn't think White Oak bayou would have as many flood issues, with the high elevation of the Heights (per the name). But in this city, where the rainfall is so hard & heavy, anything is possible. Saw a listing on TV a few days ago about bayous out of their banks, Berry Creek was included. Berry flows into Sims after running thru Meadowcreek, by the hood I grew up in (Oak Meadows). Dad took his canoe to the store one time for milk & bread. I kid you not. allen parkway underpass at montrose still has 9.5 feet of water. 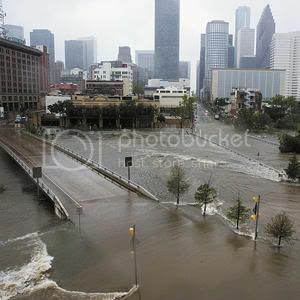 the latest houston press has a great pic of northern downtown flooding just north of franklin (along milam).